CoconutsPark - Buuka of Southern Island Episode 36 is another point and click type room escape game by Coconuts Park. In this game, you try to find the items and solve puzzles to finish the game. Good luck and have fun! same as you no idea what to do!! thanks Gabi for colour code, although I still don't really understand where "yellow" came from ? You guys are fun! Color code comes from the TV. You should have got a remote control and used it to turn the TV on, didn't you? @Try_to_escape, I thought about that too, since that was the only yellow thing I could find. But I'm still wondering how though. The hint was x-**x-- and the > signs on the bus, don't they mean "greater than" ? So, how did you combine those to get the correct colour code ? It means click on bus: L wheel, top, R wheel, R wheel, L wheel, top, top. It opens the front door of bus to get a key. I got a key that opened a drawer under the tv, but there was nothing in the drawer...??? It makes sense that we had to make glasses since in the previous episode we found out that the piggy needed them. gaby u made comment about scissors u could have explained how u obtained them. 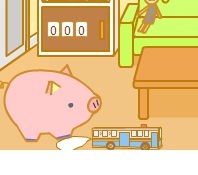 Take bus and paper from pig. Take paper from under mat and box from under pillow. Use pattern from paper on bus (wheels and top). Click front door for key. About remote and power button to turn on TV for color clue. Use number on cupboard for other magnifying glass. Look at one mag. glass and combine with other glass then add string. ty clee having just came to replay it i see where i was going wrong the 2nd mag i was hitting view iten rather than just click 2nd mag and place it with one i had up. I guess there's no optometrists on Southern Island. Awwwwww.... As usual, a very nice game! Thanks gabi - that was a tricky one. Combining the magnifying glasses with the string was too fiddly. You had to do it in strict order. You should have been able to add them together in any order...or at least use either of the magnifying glasses first. I am obviously making glasses for the pig, but it is infuriating that instead of just letting me combine the items to finish the game, there has to be some ridiculous order that takes four more minutes to figure out. It can never be as simple as just dragging the item onto the other item in these games.